For your convenience, we've placed only a few images on each page of this gallery. When you are ready, go to page 1, or 3 of this Gallery, or use the tags at the top to view other galleries on our site and place your order. Golden Days© shows a broad grassy field within Arizona’s pronghorn refuge. 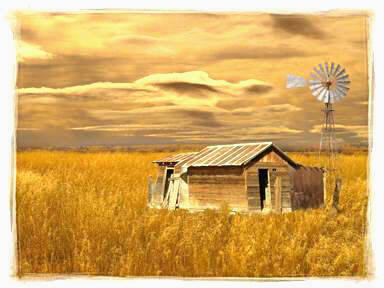 A few old settler cabins remain, their tin roofs and weathered boards reflecting the surrounding fields and sky. The colors here are quite real. arising from an unusual day of brilliant sun peeking through a thick, fast-blowing, lenticular overcast. 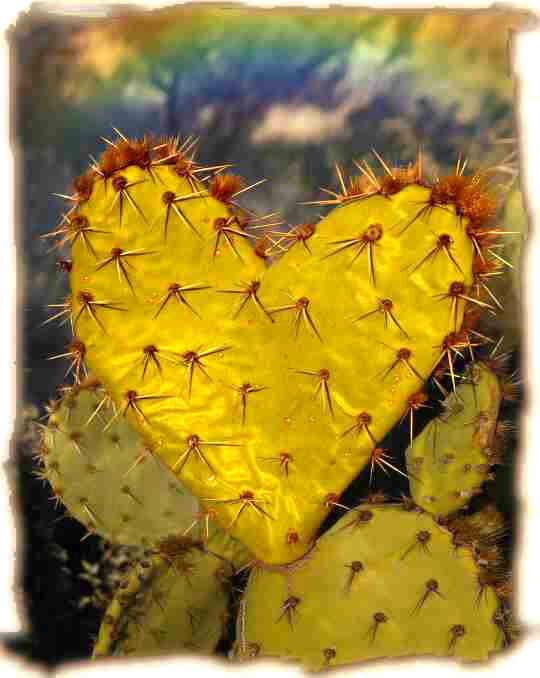 Heart of the Desert©, like true love, is a rare find. Nonetheless, on rare occasion, the pad of a prickly pear does grow into a recognizably well-loved shape. Here a real opuntia cactus seems to bring the heart of the Sonoran desert into our homes, complete with a faint rainbow to emphasize its warmth of feeling. It's a Dry Heat©. Somewhere at the top of a hill in Southeastern Arizona is a little town called "Tombstone" where Wyatt Earp and his friends shot it out with some desperadoes at the OK Corral. Its history, its played-out mines, and its boot hill have given this town the reputation of “the town too tough to die.” This is the real old west that the movies didn’t invent. Looking for Me?© Blue jays are known for their curiosity and fearlessness. This guy knows who he is, but he is wondering why we need a photograph to check him out. The sly grin on his face was soon accompanied by a little wink. 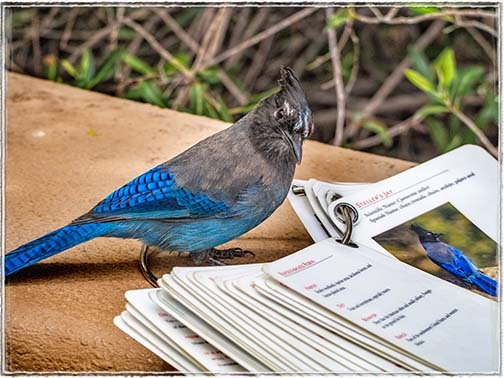 The handsome Steller’s jay of Arizona differs from the western scrub jay in having a recognizable crest. Mail Man©. The old stage coach waits just outside Tombstone’s O.K. Corral. 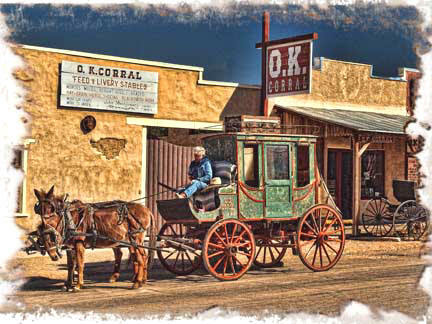 Will it pick up the mail, a young family traveling to Bisbee, a small load of gold ore from Tombstone’s mine? Or is it waiting for the end of a gunfight that is reputed to be taking place in a few minutes. Careful. Better take cover! 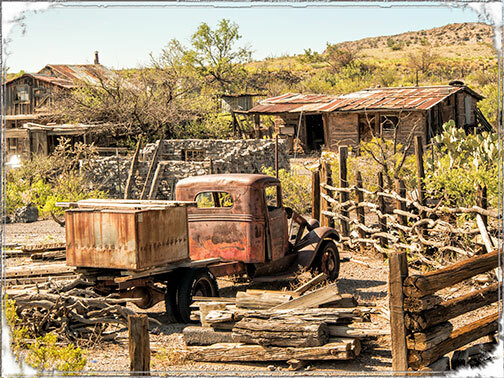 Old Times© are reflected in the landscape and ruins of the desert ghost town of Steins. The town sprang up to service the mines along the rail line connecting the cities of the desert southwest. But the riches of the mines don’t last forever and a nearby freeway eventually bypassed the little town. Here is all that remains of old times, fun, while they lasted.